Developments in laser or intense pulsed light (IPL) treatments have centred on trying to improve non-ablative light sources that do not harm the surface of the skin, but still cause visible improvement of lines and wrinkles. This treatment is usually called "photo rejuvenation", and although the aim is wrinkle improvement, these machines do not, as yet, produce the sometimes dramatic results achieved with the more aggressive skin resurfacing approach. There are many different types of laser, IPL/LHE and LED system available on the market. Each machine has its own individual profile and body of clinical evidence to support treatment claims - make sure that you ask for this when you visit a clinic. In general, most of these systems can reduce the appearance of some pigmented changes and small thread veins on the face. Claims for improvement in the appearance of actual wrinkles, any tightening of the skin, or reduction in the appearance of acne scars should be carefully questioned The cost of skin rejuvenation can be in the range of £100 - £300 per treatment. The use of light as a medical treatment has grown significantly in recent years. There are now a number of devices delivering different types of light for an ever-increasing number of cosmetic treatments. Ultra - Violet light, for example, has been used to treat psoriasis (a skin condition) for a number of years, and many people use light boxes during the winter to reduce the symptoms of seasonal affective disorder (SAD). Simply, the exposure to certain kinds of light makes people feel better! The use of laser light for medical procedures was developed in the 1960s when they were first used in operations as cutting tools by some surgeons. Lasers are also commonly used by ophthalmologists (eye specialists) for the treatment of certain eye conditions. There are also numerous private clinics offering the use of lasers as a treatment for short sightedness. Since the early 1990s, lasers have become the high tech equivalent of dermabrasion (a form of exfoliation) or of chemical peels for skin resurfacing (removal of outer layer of skin) resulting in a sometimes dramatic improvement to the complexion. The use of different types of lasers by cosmetic clinics has increased significantly in recent years. The new machines are aimed at giving you maximum treatment results with minimum recovery time after the treatment. More recent still is the arrival of Intense Pulsed Light (IPL), Light Heat Energy (LHE) and Light Emitting Diode (LED) systems that can be more flexible in their use than some other lasers. Figures from the American Society for Aesthetic Plastic Surgery (ASAPS), which started to track IPL treatments for skin rejuvenation from 2007, indicate that in 2017, 113 230 treatments were performed, a decrease of 13.1% on 2016 figures. However, this makes IPL for skin rejuvenation, the sixth most popular nonsurgical treatment in the USA. 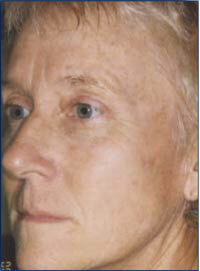 See Laser Skin Resurfacing for details of ablative and non-ablative laser statistics. If you are considering a light based treatment for improvement of your skin, the following information will give you a basic understanding of the procedure. It can't answer all your questions, since a lot depends on the individual patient and the practitioner involved. Please ask a practitioner about anything you don't understand. What are lasers/IPL/LHE/LED systems and how do they work? A Laser is a high-energy beam of light that can transfer its energy into specific areas of the skin’s tissue to treat skin problems. These beams of light are produced in one wavelength or colour at a time, and can vary in terms of their strength and the type of tissue that they can target. The so called non - ablative lasers have been a more recent introduction in types of aesthetic equipment for skin improvement. 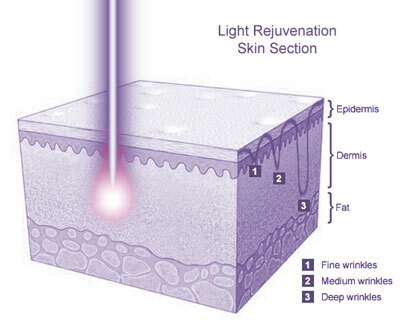 These lasers have lower energy levels than ablative lasers (which resurface or remove the outer layer of skin completely) and try to cause damage within the dermal layer of the skin without removal of the outer epidermal layers (see diagram below). That is to say that the laser treats the layers of skin under the surface without damaging the surface too much. This lessens the recovery period after the treatment and reduces the number of complications that can occur. Intense Pulsed Light systems, although technically not lasers, use flashes of light that work in a similar way to non - ablative lasers by causing heat damage to dermal tissues without disruption or removal of the outer epidermal layers of the skin. This is another treatment which you may hear mentioned. This also works by carefully controlled bursts of low-level light and heat that can be used for photo rejuvenation. Emits red light that has been shown to stimulate production of collagen in the skin. The term "Photorejuvenation" used to market these light based treatments can be misleading and confusing. The capabilities of these machines varies significantly between both types of device (laser/IPL/LED) and between equipment within these categories marketed by manufacturers. In general, most of these systems can reduce the appearance of some pigmented changes and small thread veins on the face. Claims for improvement in the appearance of actual wrinkles, any tightening of the skin, or reduction in the appearance of acne scars should be carefully questioned. Although there is evidence that some of these devices can cause improvement in wrinkles, mild scarring and reduction of large pores you need to clearly define what level of improvement is achievable. What happens during a Laser and IPL Skin Rejuvenation treatment? Depending on the area of skin and type of laser or intense pulsed light (IPL) system used, different treatment procedures may be recommended for you by your practitioner. Your first discussion with a practitioner should clearly set out your expectations. These should be matched by the likely cosmetic outcome your doctor predicts. He or she should be able to prescribe the most appropriate type of light treatment for you. A medical history should be taken to ensure that there are no reasons why you shouldn’t have the treatment. You would also normally be asked to read detailed information and sign a consent form at this time which means that you have understood the potential benefits and risks associated with the procedure recommended. This procedure generally requires no special pre-treatment care. Anaesthetic cream may be applied 20 minutes or so before the treatment to help numb the skin, and you will be required to wear eye protectors for all laser and IPL machines. Depending upon the type of system used, you may experience a slight stinging sensation in the area treated during the procedure. The treatment usually takes between 15 to 30 minutes. The procedure may be repeated every few weeks or so for 4 or 5 courses to achieve the desired effect. Afterwards, every 6 months for maintenance, as required. How long will it take to recover from a Laser and IPL Skin Rejuvenation treatment? Most patients will be able to return to work immediately following the procedure. What are the risks and potential complications from Laser and IPL Skin Rejuvenation treatment? Depending on the type of equipment used, some mild stinging or burning may be noticed during the procedure, and the area treated may feel hot for 15 minutes or so after treatment. Most patients will experience skin redness which will fade over the next hour or so and can be covered with light make up. Post - treatment risks or side effects can include lower eyelid swelling (if this area is treated) and blistering of the skin at the treatment site which can very rarely lead to mild scarring and changes in skin colour or pigment. What should you do after a Laser and IPL Skin Rejuvenation treatment? It is very important that you follow carefully the advice of your practitioner following any type of light treatment to help make the treatment as successful as possible and to reduce the risk of complications afterwards. Who should not have Laser and IPL Skin Rejuvenation treatment? Patients generally not suitable for any form of light treatment are those who have a history of keloid scarring (overgrowth of scar tissue), an active herpes infection (cold sores) or other skin infections such as impetigo at the site to be treated. You would also not be suitable if you have a history of sensitivity to light that may cause your skin to develop a rash or any other reaction. About 5% of epileptic patients have photosensitive epilepsy. These patients are theoretically more likely to have an attack if they are exposed to strobes or camera flashes. If the epilepsy is non-photosensitive (i.e. 19 out of 20 patients) then IPL/laser treatment is considered safe. For those with photosensitive epilepsy, so long as the area being treated is well away from the eyes and the patient is wearing blackout goggles (i.e. they cannot see the flash of the IPL), then there should be no problems. Who can perform Laser and IPL Skin Rejuvenation? Generally, laser or intense pulsed light (IPL) systems for skin improvement are used by trained doctors, surgeons or nurses. Some manufacturers have also produced lower power machines that can be used safely by trained beauticians. We will not feature any clinics in our sponsored listings who offer laser/IPL treatment and are not currently registered with their local Care Quality Commission. Is Laser and IPL Skin Rejuvenation available on the NHS? It is highly unlikely that anyone considering laser or intense pulsed light (IPL) based treatment for skin rejuvenation to improve the quality of their skin would be able to access this free of charge on the National Health Service. However certain regions do make special cases, and it may be worth visiting your General Practitioner before embarking upon a cosmetic procedure. What is the average cost of Laser and IPL Skin Rejuvenation? Prices for skin rejuvenation using light vary depends upon the light source used, and your particular treatment requirements. Costs can be in the £100 - £300 range per treatment session. The downside of this treatment is the recovery time, cost, and potential complications. Developments in laser or intense pulsed light (IPL) treatments have centred on trying to improve non - ablative light sources that do not harm the surface of the skin, but still cause visible improvement of lines and wrinkles. This treatment is usually called "photo rejuvenation", and although the aim is wrinkle improvement, these machines do not, as yet, produce the sometimes dramatic results achieved with the more aggressive skin resurfacing approach. In reality, many systems are capable of improving the complexion of the skin by reducing the appearance of pigmented areas and fine thread veins. Any improvement in wrinkles is less marked. The main advantage of non-ablative light based systems is that they can improve the quality of the skin safely with little or no recovery time. There are many different types of laser, IPL/LHE and LED system available on the market. Each machine has its own individual profile and body of clinical evidence to support treatment claims - make sure that you ask for this when you visit a clinic. The prices of some of the newer light machines have recently come down which means that more and more practitioners are now buying and using them. You may find that clinics recommend using light in conjunction with other treatments to help improve the overall result (especially in the appearance of wrinkles). A common example used by practitioners is the added use of botulinum toxin (or Botox®) to reduce creasing of the skin around the eyes or forehead. Female with sun damage before treatment. 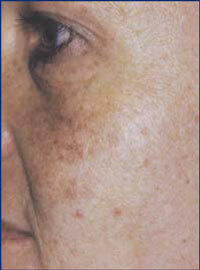 After a course of 3 IPL treatments. Female with age spots on the hands (sun induced freckles) before treatment. 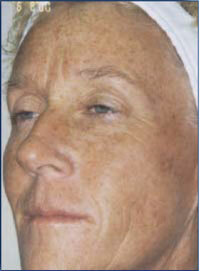 Reduction in age spots following 1 IPL treatment. Female with sun damage. 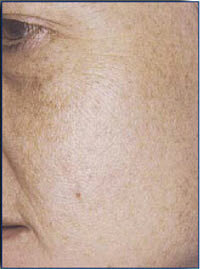 After a course of 3 IPL treatments. Click for ALL Laser and IPL Skin Rejuvenation clinics in the UK & Ireland registered and verified by Consulting Room. 2 out of 5 based on 8 customer reviews.